Please note! 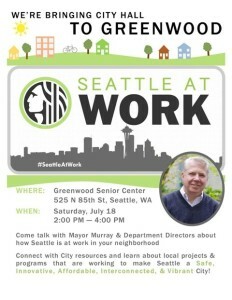 This Saturday, 2:00-4:00 at the Greenwood Senior Center, Mayor Murray, his staff and department heads will here be in Greenwood to focus on city accomplishments and neighborhood needs. Please don’t miss this opportunity to engage with Seattle to learn about city programs and activities – and make sure city leaders understand what’s great, and what needs improvement, here in Greenwood, in Phinney Ridge, and in Aurora-Licton Springs.